I could say that Cherbourg is my town’s sister (or brother?) in France, the two being connected daily by our local pride and joy, Barfleur the ferry. Being only a 4 hours cruise, taking advantage of the £24 return offer from Brittany Ferries and having a friend who moved there recently, I decided to pay another visit to the french town on the other side of the English Channel. I have been to Cherbourg before, during the August bank holiday, but unfortunately back then I wasn’t able to explore much because everything was closed (including most of the cafes and restaurants). That’s when I chose to go to Barfleur for the day and enjoy the French non-touristy countryside. This time though I was on a mission: taste as much French delicacies as possible without breaking the bank too much. Cafe de l’Etoile is one my my friend’s favorite places to go for coffee and when he heard that we were starving after the boat trip, he suggested to go there for lunch. The coffee shop is the perfect place if you are searching for an authentic French cafe, with a cosy decor and views over the busy street below. One wall is decorated with a realistic-looking bookcase wallpaper while the other have large windows with reading lamps next to them. It’s the ideal place to come and have a chat with your friends or simply just enjoy a coffee on your own while reading the paper. The menu is not very large so it’s quite easy to choose from. I never had a Croque-Monsieur before so I went for the one topped with goats cheese and honey. Croque-Monsieur is a typical french sandwich filled with ham and cheese and then baked so that the cheese on top melts and forms a crust. You can find it almost in every cafe in France. 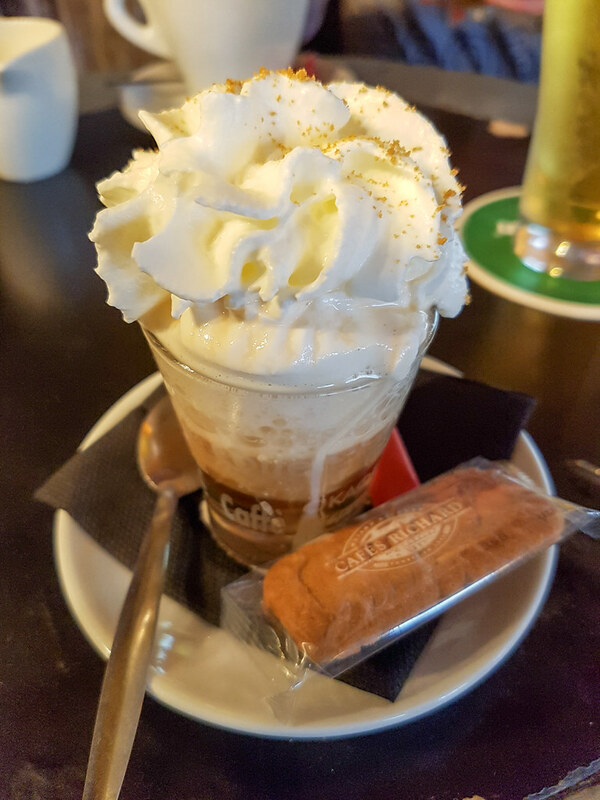 For coffee, I liked the sound of the Cafe de l’Etoile, an espresso with a touch of Chantilly, a drop of amaretto, topped with cream. It was delicious, with a delicate vanilla almondy aftertaste. You can find Cafe de l’Etoile at 2 Rue Portes, Cherbourg. Maître Corbeau is a little gem of a restaurant for which I would suggest you book in advance because we had to wait for half an hour for a table. It was worth it though because the food was beyond spectacular. Maître Corbeau is a restaurant where all the dishes have massive quantities of cheese in them and it is in the same time a heaven for any cheese lover. 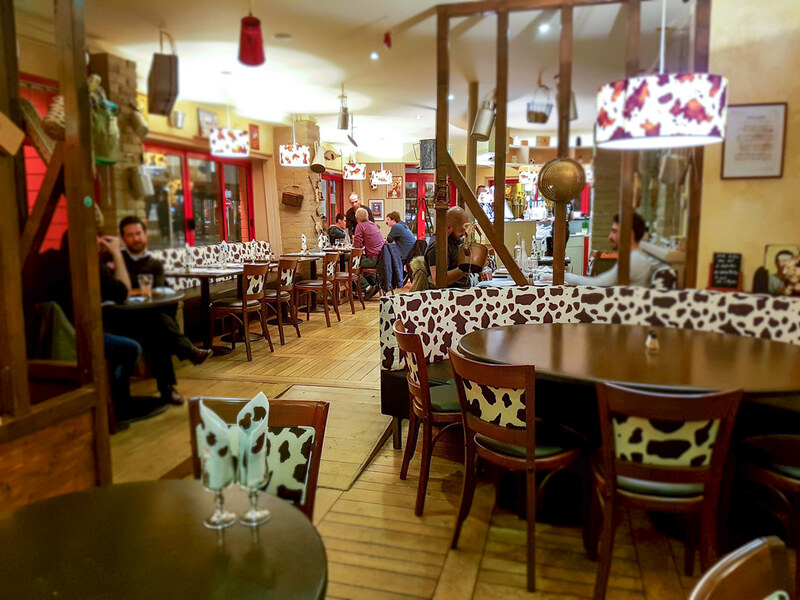 The decor of the restaurant is designed in black and white, same as a cow’s pattern while the walls are decorated with different types of cheese boxes. While we were waiting for our table we couldn’t stop staring at the big fondue pots standing on almost each table. The downside is that the menu is in French and if you don’t know the language you will have a few difficulties ordering. I went to chance and ordered the “Assiette campagnarde fumee”, after the waiter assured me that it’s a very good choice. 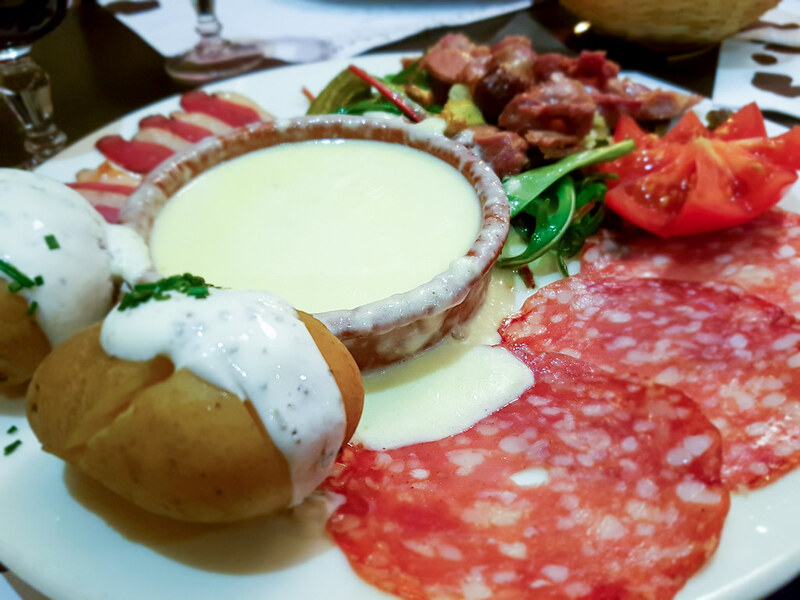 What I received was a plate full of goodies, with a pot of hot Reblochon cheese fondue to dip them in: tomatoes, walnuts, gizzards, croutons, gherkins, smoked duck breast, dry sausage and potatoes topped with white cheese, garlic and herbs. The food was delicious and plenty, I struggled finishing all of it. You can find Maître Corbeau at 12 Place de la République, Cherbourg. You can’t go to France and not stop by at a creperie, a restaurant specialised in making savory pancakes called galettes. Au Saint Michael is a small homely restaurant with only a few tables ( I would recommend again to book a table in advance) and a big fire place taking almost an entire side of a wall, where they cook the steak on an open flame. The walls are covered is uneven stones, with wooden beams on the ceiling. You can see that they have tried to keep the design of how the house used to look like in the past. Here I went for the galette Normande, a huge crepe filled with potatoes, onions, smoked sausages and a white cream sauce. 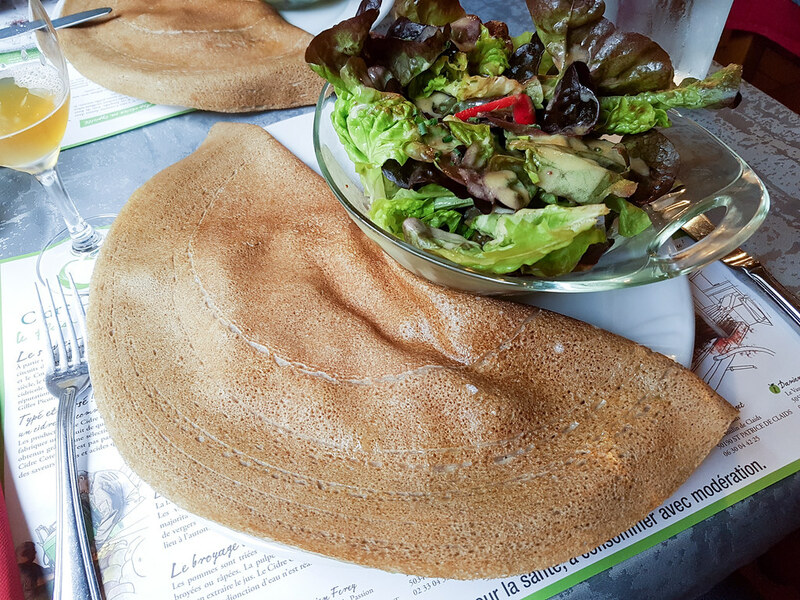 The galette was served next to a simple salad, to balance the strong flavours of the sausage and the cream. It was a delicious dish and again, I struggled to finish it because of its size. When dining at Au Saint Michael, instead of wine you should order cider. 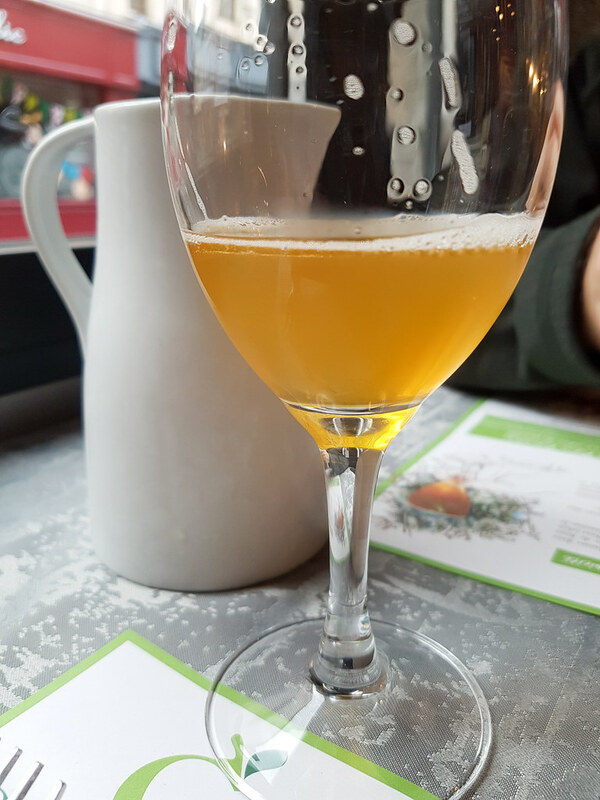 Normandy is actually very famous for its cider production and at Au Saint Michael you will find the locally sourced one which is served in cute white carafes. You can find Au Saint Michael at 51 Rue Tour Carree, Cherbourg. As I said before, on Sundays Cherbourg is a dead city. Nothing is opened, not even restaurants or cafes so if you want to go for a coffee in the morning… though luck. The only place we found opened on a Sunday was Cafe du Port, a brasserie right next to the harbour, with nice views over the boats. We chose to stay on the terrace, outside, which was surrounded by a plastic tent as the temperatures weren’t quite high at the end of March. The decor was simple, with plastic chairs and tables but we found it like a perfect place to just chill, because of the roof heaters and the blankets provided. We’ve spent a few hours there, starting with coffee and ending with beer, having lunch in between. The waiter was very friendly and laughed at out attempts of speaking in French. For lunch I chose the pave de rumsteak grille with the homemade sauce which today was mushrooms. I was hoping to try the beef tartar while in Cherbourg but it wasn’t on the menu so I went for the steak. When the waiter asked me how I wanted it I said medium-rare, as I always do. He smiled and said “rare”. “No, no, medium rare”, I replied. He smiled again and said “Rare. If you don’t like it we’ll put it on the grill some more”. You have to know that in France the steak will come slightly less cooked than you are expecting. And so did my steak, covered in the delicious mushroom and cheese sauce. I could see the bits of red raw meat though the thick sauce and I remember thinking “you wanted beef tartar? Here’s your beef tartar!”. However, as soon as I tasted the steak, it melt into my mouth releasing an amalgam of flavours that I could have only dreamed of. The steak was simply perfect, one of the best I have ever had! You can find Cafe du Port at 20 Quai Caligny, Cherbourg. It would be a sin to go to France and not eat at least one macaron, the sweet meringue-based cookie filled with tasty thick buttercream. Petit Jean is a bakery that sells all sorts of sweets, baguettes and sandwiches. I couldn’t resist their 2 for 5 euros offer on giant macarons and I had two buy them: one vanilla and one pistachio. Their taste was amazing, the crunch of the crust melting in my mouth together with the fluffy cream. Even if I love macarons, having more than a giant one at a time is not recommended due to their sweetness. It it however the perfect dessert. You can find Petit Jean Boulangerie at 1 Rue du Château, Cherbourg. 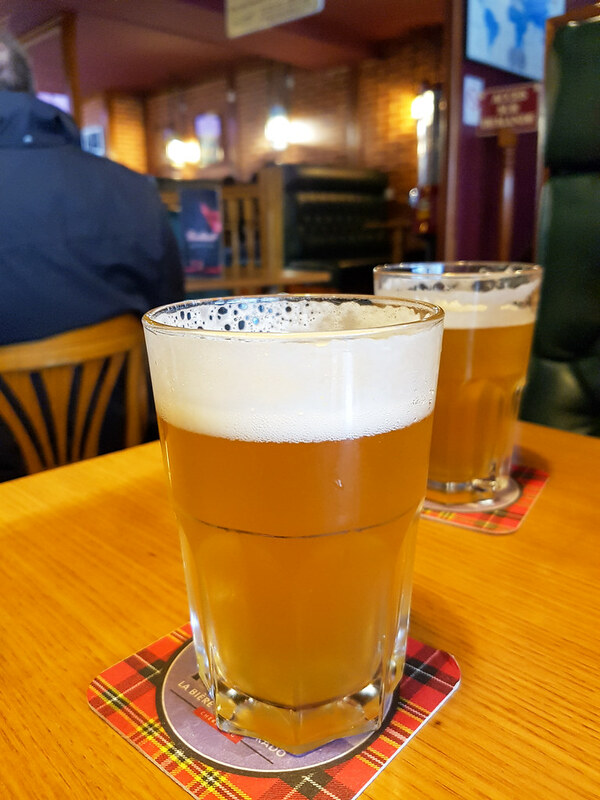 You can’t leave Cherbourg without visiting the local brewery, where you can get a beer for as little as 2 euros. Besides the four house beers: dark, ale, lager and white, they also have special beers, often changing. When I was there I got the chance to try the special IPA and the rum beer. They also had a mojito beer, but I didn’t try that one. The rum beer tasted very interesting, much sweeter than a normal ale, with an aftertaste of the Caribbean drink. I have to mention that L’Eldorado is also opened on Sundays, and even if it’s a brewery locals usually go there to have their coffee in the afternoon. You can find L’Eldorado brewery at 52 Rue François La Vieille, Cherbourg. I visited France when I was just a young child. I would love to visit again! 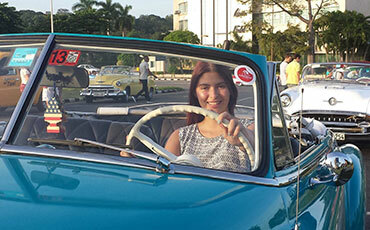 This is a bucket list item and will be done, I am hoping very soon! The pictures are gorgeous! Oh my days that Croque!! I love goats cheese so this would have been a definite win for me! The food looks so amazing! I love macarons! Oh my gosh, these foodie photos are making me so hungry! Everything looks scrumptious. I would love to visit France one day, a girl can dream! You have featured so many delicious-sounding places to eat in Cherbourg. I would really like to be able to visit an authentic crepery someday, the galettes sound just wonderful. I’m glad you had a chance to visit Cherbourg again when you could actually visit all of the eateries. Okay, everything in your post looks amazing! I’m surprised by how much cheese I see. I remember being friends with a girl from France when I was young and she lamented she gained so much weight in the states because cheese is so much more prevalent here. You had me by the time I got to the macaron! France is on my list of places that are a must go. My son just came back from Germany, so now mom needs to go to France. Seems fair, right? 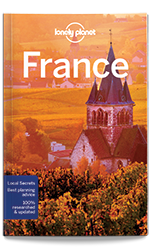 France is always one of the countries that every traveller would want to visit. The place, food and culture experience are such we look forward too. Thanks for sharing your experience! Wow, sounds incredible, I love French food! Croque-Monsieur is one of my favourites and such a simple meal. The French also cook the BEST steaks I’ve ever eaten! 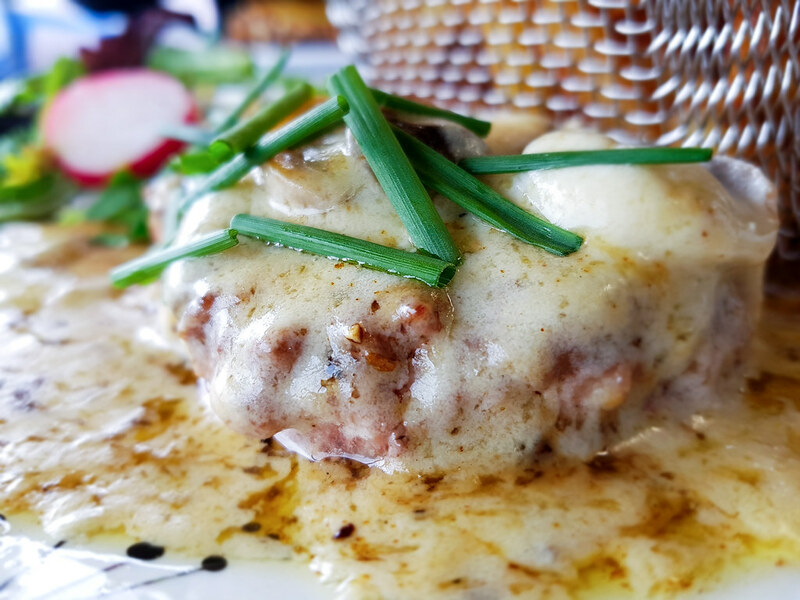 That picture in cheese and mushroom sauce looks amazing! Oh, the things I would do to get a croque monsieur here in Bangkok 😛 Cherbourg sounds lovely and those beers are quite the bargain! France has always been renown for it’s cuisine. 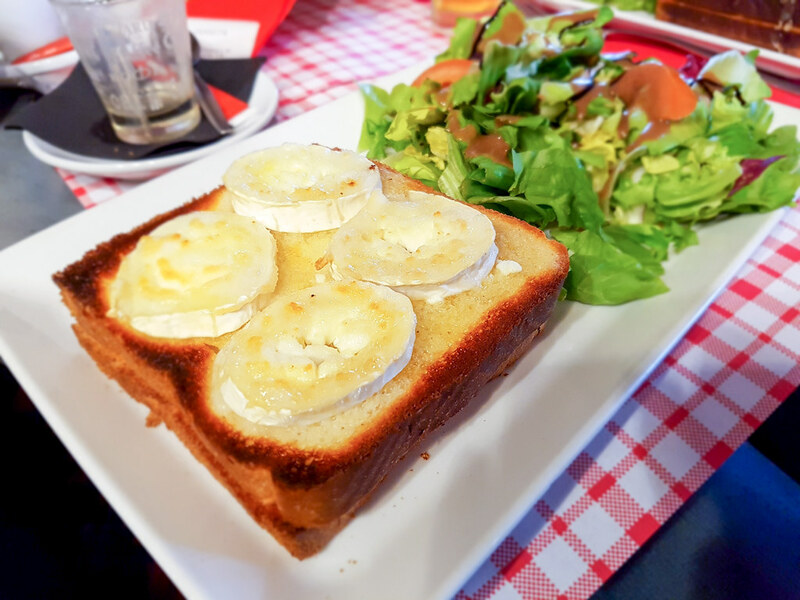 And Cherbourg, being so accessible for those of us that visit the UK, is clearly a place to experience wonderful food, thanks to this list and review. Can’t wait. That cheese fondue looks amazing! Looks like everything you tried is good. Definitely a great place to visit if you like food! OMG. These places look soooo good. I’ve always dreamt about going to France, I’m convinced even more. That’s fascinating! I love France and I am absolutely dying to go! I never knew there were so many AMAZING food options there. It’s nice to come across something written about Cherbourg. 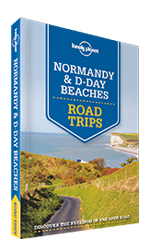 I visited the city and this part of Normandy in the spring five years ago and really enjoyed it. Thanks for this reminder. I love that you can just hop on a ferry across the channel and be in lovely France all of a sudden. I like that you choose all these typical french dishes to try. I’m a sucker for cheese so I might need to go to and indulce in some cheese flavoured foods too! Visiting France is one of my dream. It is really a beautiful place and a lot of food choices. I love to see your photos, they are so good! Wow, this all looks delicious! I went to France years ago and was so impressed with all of the amazing food! French food always looks so delicious! Especially the desserts! I have always wanted to spend a day eating French desserts. So many places to enjoy when visiting Cherbourg. I would love to eat at the Maître Corbeau. I love cheese! Everything looks so good! I’m hoping to make it to France this Fall- would love to visit Cherbourg for a day. You had my convinced at the word cheese. Delicious cheeses. Next time I’m in France I’ll e sure to add Cherboug to my list of places to eat. It really is a dream of mine to visit France some day. The food all looks amazing and I would love to try the pave de rumsteak grille with the homemade mushroom sauce. It sounds so delicious. Thanks for sharing your amazing experiences. OMW this looks delicious! Guess its true what they say about french food, all the sauces and the cheese and the bread haha. I love croque monsieur and I tend to make it at home as well. This looked like a very yummy trip! This looks like it was quite the delicious adventure. I really haven’t gotten the chance to try a lot of french food but it certainly looks yummy. 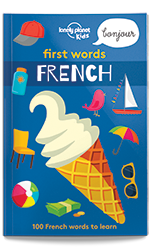 I especially want to try the Croque-Monsieur– sounds like my type of sandwich! macarons sound delicious. My mummy loves pistachio flavour! This food looks amazing. I have wanted to visit France since I was 10 years old. Hopefully soon I can visit and give all of these places a try. The french cuisine looks really delicious , I patiularly like the sound of that lovely coffee, the galette Normandy and the macarons look delectable. I have only been to Euro Disney when it comes to France but I would love to visit more places. Wow I am so jealous right now because you had a chance to taste those french cuisine. I absolutely love cheese so Cherbourg really sounds awesome to me! I would definitely be trying the cider. It looks delicious. And the food is to die for. I’m not much into steak tartar but I do like my steaks a little less cooked so I will take your instructions about ordering to heart. Thanks for he great post. 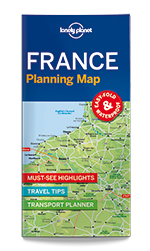 My husband and I are planning a trip to France .. and everything about your post made me all the more excited to go. The food blogger in me says let’s do nothing else but eat (especially cheese and macaroons!) .. the history buff in him says let’s see museums. Something tells me we’ll figure out a way to do both! Food in France, such a beautiful thing to think about. These all sound so good and you made me hungry by looking at all the pictures! They sure love cheese and I do too! I can imagine having an awesome time eating my way in Cherbourg. Not surprising to hear such rave reviews about these french delicacies. Crêpes are always a must when visiting France. Although the Maître Corceau’s menu looks tempting, this would not be a place for me since I have to avoid eating cheese at all costs (I know, sad!). Thanks for sharing your top spots. Oh my, I want that Cafe de l’Etoile! It looks so amazingly delicious! Yum! 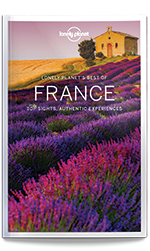 I really like France – their food, wine, culture and landscapes are so worth exploring! Wow, what a beautiful place, the food looks delicious! Yummy! France is amazing, i was in Montpellier the south of France. Beautiful city. I’d love to visit these cafes……great meals; I’M HUNGRY NOW; get me some of those 🙁 Beautiful! I have never been to Cherburg in France before . However after seeing your wonderful photos and food shots I most definitely will be visiting. 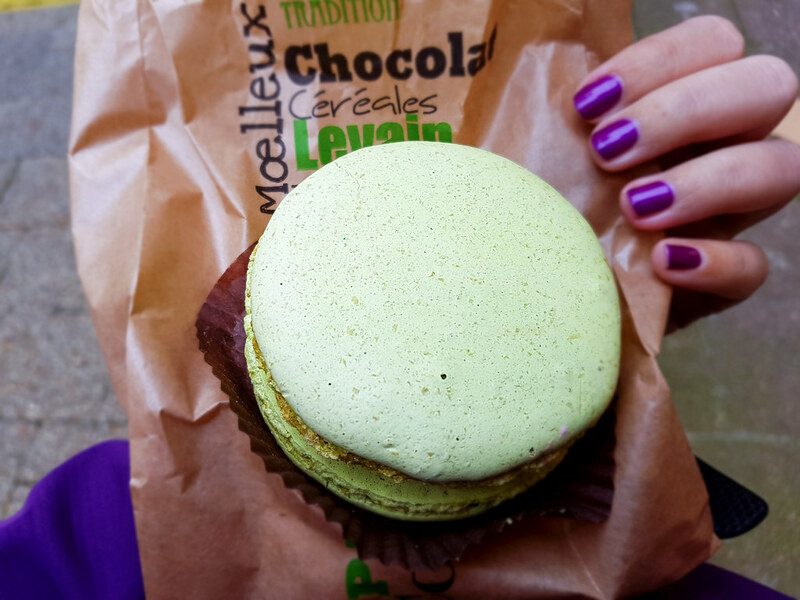 That photograph of the giant macaroon is just too delicious to resist! Everything looks so delicious! I have only been to Paris in France, adding this for next time. Wow,I love how they serve biscuits along with the hot chocolate!Yum! The steak description was phenomenal. Oh My, that sounds yummy. I see that I could get very spoiled in France, when it comes to their food. Everything looks so beautiful. Thanks a ton for sharing. It’s always a good thing to know where is good to eat before visiting a place. The steak sounds delicious! My husband and I are moving to Cherbourg in a couple of months and I am very grateful for your fabulous recommendations. Australia to France is going to be a big leap but with your help, my food journey has already begun – thank you! Whenever I go to a new place I always makes sure that I try their food. Exactly, i’m a huge fan of newly discovered food and this one is something I would love to taste. I haven’t been to Cherbourg France and I’ll surely make sure that I’ll get to indulge myself in their luscious food if I get there soon. Thank you so much for sharing this with us. You have just made me hungry now. A croquet monsieur is my absolute favourite thing about france! I love this post as we are sailing to Cherbourg next year and will have all of the kids who will no doubt be hungry! Saving for future reference!